"Slip Bomb" redirects here. For information about Samus's custom special move, see Samus Aran § Bomb. Bowser Bomb is an attack that is used by Bowser and Giga Bowser in Super Smash Bros. Melee, Super Smash Bros. Brawl, and Super Smash Bros. for Nintendo 3DS / Wii U, and by Bowser in Super Smash Bros. Ultimate. It is executed by pressing Down + . When performing the move, Bowser (or Giga Bowser) jumps forward diagonally and smashes down on the ground, damaging any opponents under him and launching them into the air. The shock wave upon landing can also deal damage to nearby fighters, but its range is often limited. Whenever the attack hits, it features freeze frame properties that can potentially mess up the timing of opposing fighters who try to counter it. However, the freeze frame properties are not present in Super Smash Bros. Brawl, while in Super Smash Bros. for Nintendo 3DS / Wii U, only Bowser's Bowser Bomb has freeze frame properties; Giga Bowser does not receive freeze frames for his version of Bowser Bomb. 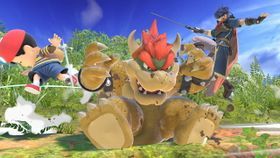 Super Smash Bros. for Nintendo 3DS / Wii U has two new variations of the move, which can only be used by Bowser; Giga Bowser can only use the default Bowser Bomb. Turbulent Bomb (known as Turbulence Bomb in PAL regions) pushes back opponents near Bowser as he lands, in exchange for less damage and knockback. Slip Bomb trips any opponents near Bowser as he lands, in exchange for slightly less damage. Bowser Bomb is also Mini Bowser's special ability in Mini Mario & Friends: amiibo Challenge. It is performed whenever the toy walks off a platform or a ledge, making him capable of destroying rows of Rock blocks encountered underneath. This grants Mini Bowser access to areas other Minis cannot reach. The move needs to be executed in Level 10 to access Mini Bowser's assigned amiibo Door by pummeling a Rock-filled gap that leads to it. The door leads to Mini Bowser's set of levels, Fire Ride Fortress, where he makes extensive use of this ability. The move is based on one of Bowser's attacks in Super Mario Bros. 3, in which the Koopa King slams where Mario or Luigi is standing. In fact, the position Bowser gets into when using Bowser Bomb is even borrowed from Super Mario Bros. 3. This page was last edited on January 6, 2019, at 17:13.